Table tennis is a fast game. You need quick reactions to cope with the random patterns of play. Here’s a typical situation from one of my coaching sessions. I start with a regular drill, where the player knows where the ball is going to go. The player knows where the ball is going, so effortlessly moves into position, plays a stroke and moves effortlessly to the next ball. I then make the drill harder by adding a random element, so the player doesn’t always know where the ball is going to go. Now the drill is much harder. At first the player struggles. The irregular pattern of the drill disrupts the player’s rhythm. The player seems to be chasing each shot, always a step behind, until the drill breaks down. I tell the player to watch me. Really watch me. Watch my bat, my wrist, my body movements. Yes, keep playing the strokes, keep moving, but watch me as I play my strokes. The player almost always finds the irregular drill easier to do. Sometimes a lot easier to do. So what is really happening here? Why has the player suddenly found the irregular drill easier to do by watching me as I play my shots? By focusing more on me, the player is able to see quicker where the ball is going. Sometimes the player can work out where the ball is going before I even hit the ball, just by observing my body shape and position. By watching me, the player gets an extra ¼ to ½ second to react, move and play. A fraction of a second doesn’t sound a lot. But in table tennis it is. The game is so fast and players so close to each other, that even a fraction of a second can significantly increase reaction time and make a big difference to your ability to play shot after shot after shot. I notice this a lot when I play too. I am guilty of switching off a bit too often. When I switch off, I stop watching my opponent. I’m not sure what I am actually watching, but I suspect my eyes are just following the ball part of the time. When I switch off like this, I always feel like I am reacting, stretching, leaning. I just don’t feel like I have time to move my feet. I see the ball too late. I get stuck to the ground. The best I can hope for is a weaker compromise shot, where somehow I get my bat to the ball and I’m still in the rally. This isn’t good table tennis. But when I switch back on, my goodness there is a big difference. I really watch my opponent and all of a sudden I seem to have so much more time. With this extra time, I am able to move my feet into position quicker. By getting into position quicker I have more time to play a proper stroke. If I play a proper stroke the quality of my table tennis is much better. This higher level of play is simply the result of watching my opponent more. So the next time you play, make a big effort to really watch your opponent. When your opponent serves, you watch. When your opponent returns your serve, you watch. When your opponent plays every shot, you watch. If you really focus on your opponent, you should notice a big difference. You will react quicker and move quicker and you will have more time to play better quality strokes. Give it a go and please let me know how you get on. It’s so true! Excellent advice, my problem is I tend to switch off too often, remain switched on is a challenge, I guess it will come with practice. Thanks for the reminder! Interesting as I’ve been told by other coaches to watch the ball at all times and you will pick up on the body movements in your perphial vision. I will try to watch the player more often to see if that improves my reactions . Excellent site btw, very good advice on here. Well, yes if you are watching the ball all the way to your opponent’s bat, then you will be watching your opponent too. I agree with this. For me, I can get a bit sloppy and only start watching the ball after my opponent has hit it. 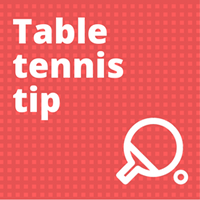 If I tell myself to watch my opponent, I then watch the ball all the way to my opponent and then react quicker to next ball. Something worth trying. It may help. Your answer makes perfect sense. I’m starting to wonder if I’m actually only watching the ball once it’s coming back my way. I will try both and see what happens .